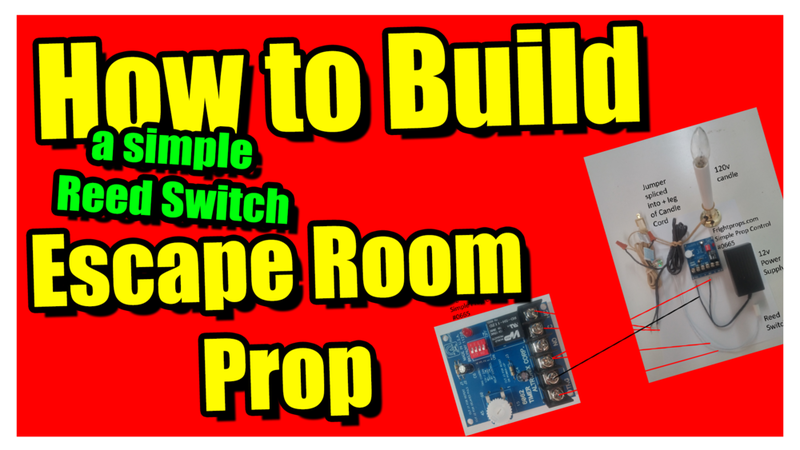 How to Build A Simple Reed Switch Escape Room Prop. There is a lot of wonder in modern escape rooms. Hatches pop open, lighting effects are triggered, pillars ascend revealing a hidden treasure, doors seem to appear from nowhere. It is often this magic that enthralls us Escape Room enthusiasts but it's not all smoke and mirrors there are solid engineering and advanced electronics in many of these props. Many Escape Room owners are very good tinkerers and builders who can create these marvelous effects. The rest of us want to have some of that magic in our escape rooms but have to pay a tidy sum to have it. Let's face it. Engineering knowledge, design, experience, and the cost of building that magic box are expensive, and rightly so. The good news is for do-it-yourselfers, there is help available. The Escape Room Technology and Props group on Facebook! If you are not familiar with the Escape Room Technology and Props group, it is a forum where members of the escape room community who are tech wizards, answer questions, provide guidance, and often offer direct assistance to create awesome props and effects in our escape rooms. A cost effective solution I provided was using the Frightprops.com simple prop trigger #0665. An easy to understand, low-cost, easy to configure solution. It does not require any programming knowledge. It only requires an understanding of a simple circuit. Update: 08/21/2017: The prop controller's generic name and part number is the Altronix 6062 Multifunction timer. It is readily available on Amazon.com. The picture below illustrates how to set up the 0665 simple prop controller using a magnetic reed switch and an electrical candle for demonstration purposes. I created this short video to explain how the 0665 simple prop controller functions. The Items used in the creation of this video are available here. With this as your foundation, you can start to build some of your own wonderful gadgets for your escape room. If you are the type to tinker and build the world of microcontrollers such as Arduino and Raspberry Pi and advanced systems such as Programmable Logic Controllers the Escape Room world is your oyster. Here are more ideas on how to build your own tech props to add to your escape games: ESCAPE ROOM TECHNOLOGY. IT'S NOT MAGIC, IT'S ILLUSION!